Fusion is too cheap of a word to describe the newest food offering at The Mesmerist. Owner Fayaaz’s parents were Gujurati migrants to Uganda, part of a contingent of roughly 90,000 Asians displaced without warning in August 1972 by the executive proclamation of Idi Amin. Asian assets were confiscated by Amin’s army, leaving all but the wealthiest families with nothing when they arrived in the UK, Kenya, and Canada. As with other instances of forced migration, gustatory delights emerge in the penumbra of political turmoil. Kitgum serves up what is nominally an organic blend of Gujurati and Ugandan food. In reality, Kitgum’s food is actually an outgrowth of the Ismaili cuisine served in owner Fayaaz’s childhood home. I went to meet Fayaaz and his wife Susie at local heroes Bond Street Coffee in the lanes. My preconceptions about a one-man pop-up operation turned into a full service kitchen were promptly dismantled upon hearing about Susie’s vital role in management and branding — Kitgum is a veritable husband and wife team. Their development parallels a number of beloved pop-ups that sit in pubs due in part to soaring commercial real estate prices. The pair tell me that this trend is undoubtledy a force for good. Fayaaz used to own a business that installed clean energy fittings. After the Conservative government scrapped subsidies to renewables in 2015, Susie’s continued urging, and an epiphany involving an elderly man longing for the freedom of youth, the pair finally decided to move forward by taking over the kitchen for an evening at The Dover Castle in hilly Hanover. 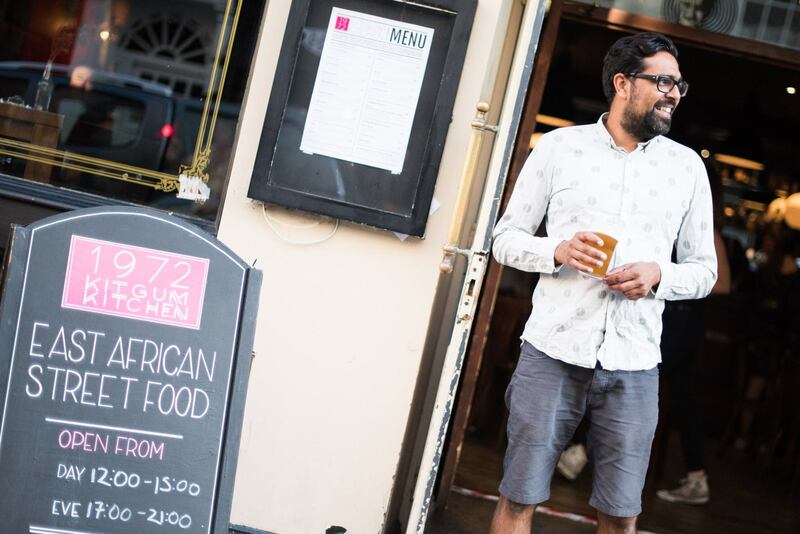 A few residencies around other pubs served as proof of concept, and Kitgum has finally found a semi-permanent home in the vaguely steampunk styled Mesmerist near Old Steine. Their development parallels a number of beloved transient food pop-ups that sit in pubs due in part to soaring commercial real estate prices. The pair tell me that this trend is undoubtedly a force for good, as it allows aspiring food operators and restaurateurs into the market without massive financial risk and masses of existing equity finance. If Kitgum’s medley of syncretic East African food is anything to go by, the scene is a smashing success. The big points of appeal are affordable small plates (£4 each) and a very vegan friendly menu. The stars of the show are the Zanzibari dar nu bhajia, essentially a falafel crossed with a bhaji, cassava chips, the kofte-like Kitgum Meatballs, and excellent chapatis. The Kuku Pata (a chicken curry) marries ginger, garlic, and coconut for a savory and moreish delight. While the dishes are consistent, well-seasoned, and punchy, the range of accompanying pickles and sauces is superb and relatively new to the Brighton food scene. An Ismaili pickling of julienned carrots masterfully mixes sweet, savoury, and spicy flavours, notes of turmeric and garlic abound. A coconut twist on traditional coriander chutney brings life to every dish on the menu. Not even the finest home-made student slurry of storebought sauces could ever compare – and with the present pseudo-scientific revolution of the microbiome, the South Asian tradition of achaar is bound to enchant the masses. Kitgum’s pickles are incredibly accessible compared to some of the eccentric flavour combinations found in the pickles of the sub-continent. A prescient choice indeed. What will keep people coming back is the particular mix of flavors on show that resemble but never mirror the parent cuisines in question. This food is not the product of fusion — carefully (or carelessly) matched flavour profiles from disparate heritages — but instead of a more organic attempt to bring a severely underrepresented cuisine to our multicultural city.